Nnenna Ezeike is a Senior Employment Counsel in the Cantor Fitzgerald and BGC Partners legal team based in London. Nnenna’s career has included roles at KPMG, Slaughter and May and in industry. She has advised clients ranging from multinationals to smaller privately owned businesses on a broad spectrum of employment law and HR issues. Nnenna studied law at the University of Bristol and completed her Master of Laws degree at King’s College, University of London. She is qualified as a solicitor in England and Wales, a member of the New York Bar and an Associate of the Chartered Institute of Taxation. Committed to improving diversity and social mobility in the legal profession, Nnenna has founded in-house work experience initiatives in partnership with Aspiring Solicitors since 2014. She also assists aspiring lawyers by providing one-to-one mentoring and coaching. 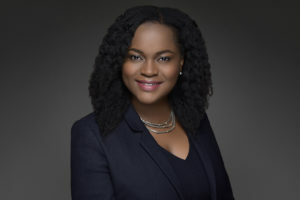 Nnenna won an All Star Award in 2018 for her work with Aspiring Solicitors. “From personal experience, I know how difficult it can be to break into a career in law unless you have the right connections or fit into a particular mould. I am passionate about helping others overcome the hurdles I encountered. People should only be limited by the extent of their ambition and how hard they are prepared to work. Having the best talent from diverse backgrounds can only improve an organisation’s performance and ability to innovate.